House cleaning is a chore that I absolutely hate. I live in a large two-story house with four bedrooms, a game room, formal dining room, formal living room, family room, breakfast area, three bathrooms, and an office (which mostly stays cluttered). Having all this space, I am sure you can see why I hate house cleaning ( Just a little secret, between you and me, I really did not care for house work when I had a lot less space, neither). With all these rooms to keep clean, I have had to find easier ways to keep my house clean. Some things I have figured out on my own and others I have found by researching. Below are some tips which have worked for me. 1. 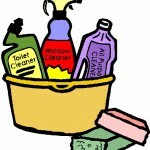 Gather all your cleaning supplies and keep them in a container that can be carried from room to room. 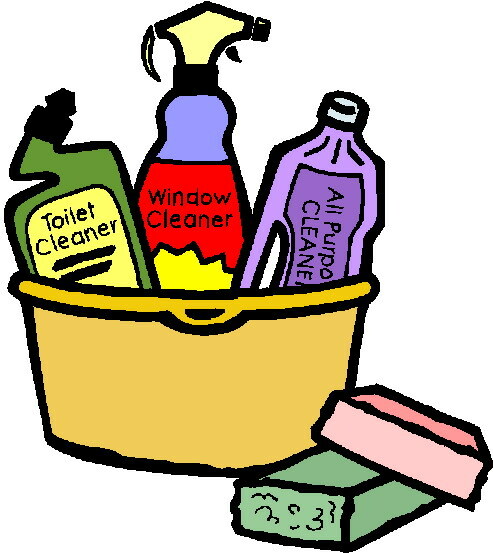 You will need a feather duster, furniture polish, glass cleaner, bathroom and/or kitchen cleaner, stainless steel cleaner (if applicable), toilet bowl cleaner, several dusting rags, and several cloths to clean the counters, mirrors and kitchen and bathroom fixtures. 2. Think of your house as wet rooms and dry rooms. Obviously the wet rooms are any rooms with access to water. If you have help, one person may take the wet rooms, while the other takes the dry rooms. If you are working alone, do the wet rooms first, because these are always the most involved and will make your work go much smoother, once these rooms are finished. 3. When possible, schedule one day of cleaning each week. Do this by looking at your calendar or to-do list and actually schedule it in with all your other appointments. Obviously, if you work Monday through Friday, Saturday would be a good day. If you do not work, but have other appointments, then pick a day during the week and put it on your calendar. This way you can relax with your family and friends on the weekends. The point is that if keeping a clean home is important to you, it has to become a priority in your life or it won’t get done. 4. Do not try to do thorough cleaning in every room each week. This is almost impossible to keep up with and will almost always overwhelm you. Instead, alternate your weeks between thorough cleaning and light cleaning. Light cleaning is walking into a room and picking up clutter, running a feather duster over everything, cleaning any obvious dirty areas, such as smudged glass, and sweeping/mopping or vacuuming. Thorough cleaning is just as the term implies. It means to thoroughly clean that room, no matter what it involves. This involves wiping down counters and cabinets, cleaning windows, polishing furniture, cleaning ceiling fans/light fixtures; etc. You should also be realistic; if you look at something and it is not dirty then don’t feel you have to thoroughly clean it, just because it’s your week to thoroughly clean. You will waste lots of valuable time if you do this. 5. Divide your rooms up each week. One week certain rooms will get thoroughly cleaned, while other rooms get the light cleaning. You may want to thoroughly clean wet rooms one week and dry rooms the next. Of course in areas where you might have a lot of traffic, such as the bathrooms, you may not have any choice but to thoroughly clean this room each week (after all you would not want your family to have to bathe in a dirty bath tub, right?). 6. When cleaning a room, learn to clean from top to bottom, and then from left to right. I’ve heard many people who are, or once were, professionals say the same thing. This should be done by working from left to right, dusting off curtain rods, blinds, windows, ceiling fans, picture frames; etc., first. Next, again working from left to right, dust furniture or clean counters, cabinets and fixtures. Finally, still working from left to right, sweep/mop or vacuum. By cleaning from top to bottom, all the dirt goes down for you to clean next. By working from left to right, you will learn to only focus on one area at a time, keeping the job from becoming so overwhelming. You will also be less likely to overlook an area. 7. Once a month, choose a project that is not otherwise part of your weekly cleaning. For instance, you might want to thoroughly clean all the base boards one month. The next month, you might clean out the refrigerator and pantry. The following month you might choose 2-3 closets to re-organize. Perhaps you might have more than once a month for these projects; just get them on the schedule. 8. On days when you’re not doing scheduled cleaning, keep laundry and dishes done. Try to keep clutter picked up each day so that your home always looks fairly neat. 9. Choose one day a week to strip the beds and wash sheets. If necessary, these can be divided up into one room at a time until all beds have clean sheets for that week. 10. When your one weekly cleaning day is all done, reward yourself with something special like a dinner out, movie night, or curling up in your favorite chair with a good book. Cleaning becomes much easier when you have a plan and keep on schedule. Don’t let it overwhelm you or get out of hand. If you have a particularly hectic week and do not get all your cleaning done, don’t beat yourself up – it will still be waiting for you the following week. It is not the end of the world if your house is not spotless. The most important thing is to find a system that works for you and your home. What cleaning tips do you have that work in your house? 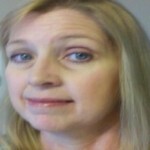 I think I am just gonna hire me housekeeper…….LOL, I am worn out just reading about all the work……LOL, great tips! LOL. Thanks for the comments, Beth. Great and helpful tips you got!For me, cleaning is mandatory. I don’t like to see dust, dirt and clutter everywhere. You are right, clean from top to bottom and left to right! It’s easier that way ! I have a minimal decorating style I’ve learned through the years. It looks nice but not a whole lot of extra knick-Knacks and things to dust around. Now I still struggle with cluttered closets and my office, but like you, I don’t like to see a dirty house or clutter out in the open. Thanks for the comment. Thanks, for the great tips.